Whew! That seems like a long title for what is really a simple dish. Over the past few weeks, I feel like I’ve been posting some pretty meat heavy dishes and have decided it’s time to lighten up the menu a little bit. I’ve also decided that it’s time to play around a bit more with the vegetarian meals we have at home. I try to make a meatless dinner once or twice a week, but lately I feel like I’ve fallen into the rut of making the same few dishes over and over again. In an attempt to change things up a bit I’ve been playing around with tofu. It’s something I have very little experience with other than the few little bits that are usually in my miso soup. Tofu has a lot going on for it, nutritionally speaking. It’s loaded with calcium, iron, b vitamins and it’s an excellent source of protein, making it a great option for meatless meals. Although, tofu itself has very little flavour, if properly prepared it will readily absorb other flavours. It acts like a sponge and just like you would wring out a sponge before attempting to soak up more liquid, you must drain tofu (see instructions below) before it will begin to absorb more flavour. It’s a very simple process, but a very necessary one. 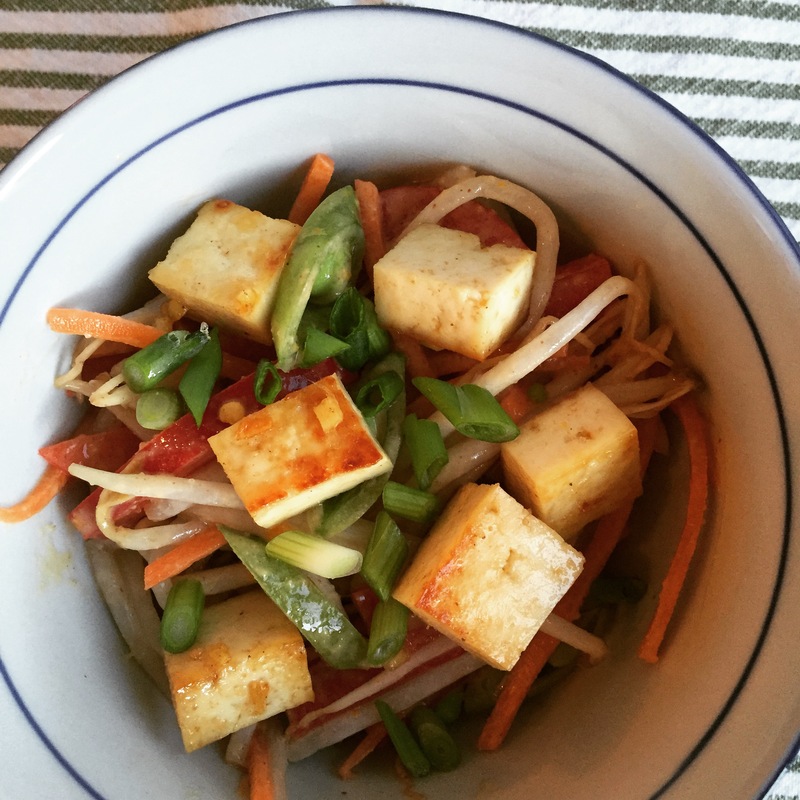 This is my first attempt at creating a tofu based recipe and I think it turned out really well. This is based almost entirely on the fact that my, typically very carnivorous husband, went back for seconds. So, even if you’re skeptical, I hope you try it out and, if you do, please let me know what you think. Just one more quick note: This recipe serves two, as there was absolutely no way I could convince my 7 and 4 year old to try the tofu. Start by draining the tofu: Wrap the tofu in a dish towel (or paper towel) and place it on a plate. Place a pan or other heavy object on top of it and leave it for about 30 minutes to press the liquid out of it. Remove the tofu from the towel and cut it into 1/2″ cubes. In a mixing bowl, whisk together all the remaining ingredients. Add the tofu and let it marinate for 30 minutes. Heat the olive oil in a frying pan. Remove the tofu from the marinade and add it to the pan . Cook for about 5 mins, turning the tofu occasionally, until it has browned on all sides. Serve on top of the bean sprout salad. Whisk together all ingredients and set aside until ready to serve. Combine all ingredients together in a salad bowl. Toss together with the peanut dressing just before serving. Hi Elaine, It’s nice to meet you, too 🙂 Thank you for your kind comments. There are always so many delicious looking dishes at Fiesta Friday. I look forward to it each week.